Timing the Lines of the Hands! 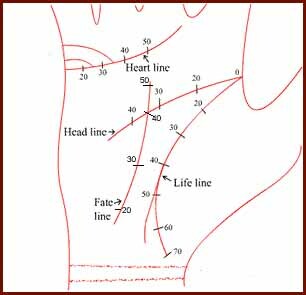 An examination of chronology in Palmistry. As readers already now, major differences exist between Eastern and Western traditions in palmistry. Even though many say that one stems from the other. One of the differences in practices is about how to tell time on the lines. Some palmists say you have to look at both hands to determine the timing of important events. There is no automatic method that is guaranteed to work every time. Some recommend locating an important event that happened to the person in the past, then measuring backwards and forwards from that date once you locate it on the palm. For example, I have here the palms of a Santa Barbaran who works in a bookstore. About two thirds of the way down her heart line lies a writer's cross, hooked to the heart line and stretching down towards the mind line. This means the cross is situated between the Apollo (ring) and middle (Saturn) finger. I would hazard a guess that at some point in her life she took up a serious interest in writing. The writing project was about her own heartfelt experience, which she strained to analyze. If I were reading her palm in person, instead of through Xerox, I would ask her if she had ever attempted such a project. I would remain nonplussed over her surprise that I identified one of her past activities, and ask her calmly and nonchalantly about how old she had been at the time. This would give me an event in her life at a particular moment in time, and I would then read her heart line and her mind line backwards and forwards in years stemming from this significant event. Just looking at the Xerox copy she mailed to me, I would say that this endeavor happened between the ages of 35 and 40, when she probably did some writing and thinking about her personal experience, most likely inspired by some modes of analytic thinking. Perhaps she had been in graduate school at the time. Perhaps she had chosen to write a paper that used theories to explore her own psychological issues. Another indication of this timing would be to look at the Destiny line. This is the line that starts at the bottom of the palm in the center and rises up to the mind line. It usually arrives there at about 35 years. In her palm, just at that juncture, another writer's cross appears, along with a triangle. This convergence indicates that it is her destiny to use her mind to lead her in creating new understanding. Prior to the time of about 35, she had been operating primarily on an intuitive basis. I sense this because the Destiny line is embedded in the intuition line. As this line veers upward, a sister intuition line gives more force and meaning to that type of worldview. In ancient times, all roads led to Rome. 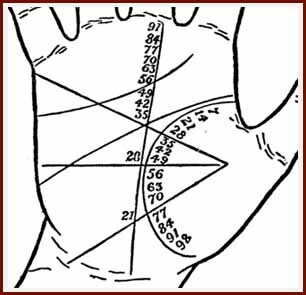 In the palm, several lines can show the same key energetic constellations emerging in various positions of the hand. These constellations manifest in different forms. The trick as a palmist is to read not just the parts, which provide bits of information, but the whole. Batya Weinbaum is a proficient palmist, artist and writer. Call 216 233 0567 for personal consultation. She runs a monthly teaching newsletter, Tending the Soul Through the Palms. A subscription is $35. Gift markings in your hands!